If your standards are high for comfort, ease, and luxury while traveling, then go ahead and reserve your spot at Princess Quarter’s Red Rock Villa. This is a three-bedroom villa (all king sized with en-suite baths), so it’s perfect for any group of 4-6, and comes with a professional-grade kitchen, indoor and outdoor dining areas, a family and entertainment room, and an angular infinity pool with poolside bar. Plus there is a beautiful koi pond right in the atrium, gardens just outside, AND guests have access to a private spa area on site-just hire any one of Virgin Gorda’s professional spa personnel. Daily housekeeping, pool, garden, laundry, and concierge services are included; all you have to do is relax and enjoy yourself. Red Rock Villa at Princess Quarters is a unique and private three-bedroom villa with breathtaking views of the Caribbean Sea and landscape. It features an amazing rectangular horizon pool with a fully equipped pool-bar, luscious tropical gardens, a beautiful Koi pond in the atrium, a living/dining room attached to a professionally equipped kitchen, a media-room with state of the art Satellite-TV, VCR, DVD, Internet ports, and Bose-Stereo equipment, and indoor and outdoor dining facilities. The beautifully designed bedroom suites all have king-size beds, allergy-free latex mattresses, air-conditioning, and exquisite bathrooms. The villa is designed around an atrium with a pyramid shaped greatroom and the bedroom suites, ensuring total privacy. Daily maid service, pool, and garden services are a part of your first-class holiday vacation rental. 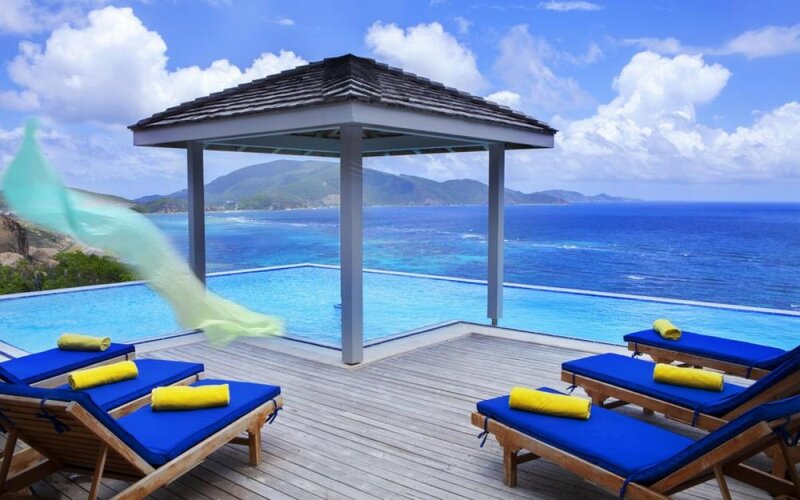 As a special attraction, Red Rock villa features a private wellness and spa area to treat both the body and mind when you hire professional spa personnel from specialized companies on Virgin Gorda. Virgin Gorda in the British Virgin Islands is the easternmost island in the group. A high mountain peak is centered between the North Sound area and the southern Valley region. Princess Quarters and the villas are located near The Baths and historical Copper Mine Ruins in the lower part of the island. Rates do not include: tax of 10%, island charges of 9%.